Sometime in the fourth quarter of the 2015 Rose Bowl, I made the mistake of getting on Twitter for a second. I like to know if I’ve missed anything, mostly news wise, while I was doing things more important than hanging out on the Internet for three hours. Nothing unites today’s hipster Twitter Americans like the misfortunes of others, and Florida State was providing a bounty of material because the Seminoles were finally going to lose, and every 20-something and media member on social media could revel in the loss by some sort of weird osmosis turned into GIFs and whatever Memes are. There was little about how good Oregon was … and Oregon is very, very good, almost bloodlessly good in choking opponents out. There was very little about how the Ducks came out of a close game at halftime and obliterated previously unbeaten FSU. 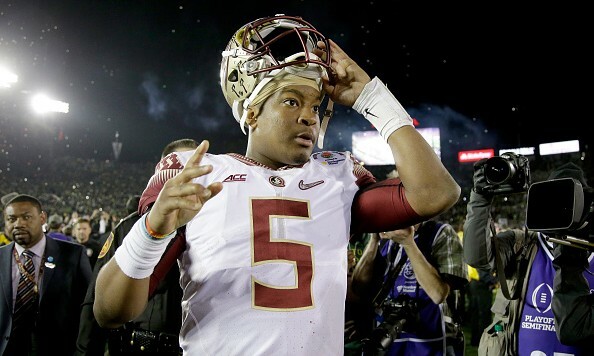 It was all Florida State, because … honestly, I don’t really know. But as we write the obituary on the Seminoles, it might be worth appreciating what they did, because you might not see it again. Jameis Winston lost his first game in 27 starts, likely finishing his career at 26-1. That is truly remarkable in a day and age in major college sports when sustained success is nearly impossible, because players are leaving at the first whiff of anyone wanting them in the pros, and because you just don’t come into sports like football, start your first two years, and not lose. As we’ve come to see this bowl season, you can take your rankings and stuff them. Clemson obviously was a good football team. So was Georgia Tech. Try as you might want to degrade FSU’s schedule, the Seminoles beat whom they had to beat, and along the way, some of those teams were pretty decent. Spare me the TCU talk in relationship to FSU. Maybe the Horned Frogs should have beaten Baylor if they wanted this crack. After all, it was only about six weeks ago that those same Horned Frogs were being skewered for clipping woeful Kansas by “only” four points. Any given week, folks, the guys across the way from you can be tough. FSU won games close; the Noles won games by a lot. They always gave a shot at putting together a solid non-conference schedule, and in 2014, sometimes the opponents didn’t comply with their usual timber (see Notre Dame and Florida). We spend so much time in sports devaluing what teams, individuals, and coaches do. We rarely spend time appreciating what we’re watching and realizing we might not see it again, especially team achievements. Winning and success breed contempt in the public like nothing else, for some odd reason. FSU ran out of gas on New Year’s Day because Oregon was too good, and the Ducks weren’t going to let the ‘Noles off from making mistakes. They were going to score whenever they had the ball, keep throwing gas on the fire, and challenge you to match them. The ‘Noles complied with terrible mistakes, mentally weak turnovers, and fundamental errors, in some part probably because they knew that every time they had the ball, something big had to happen … because … Oregon. But spare the world your hipster social media jokes and cheap group think comments. We might not again see a freshman win big and, in subsequent seasons, claim his first 26 starts in college. We might not again see all of these achievements bundled together: two consecutive unbeaten regular seasons, one Heisman, one college football championship, two chances at another one. What Florida State did was unique. It ended at the hands of a better team. But we saw something special over the last two years that will likely not be replicated anytime soon. Now, back to your regularly scheduled jokes.